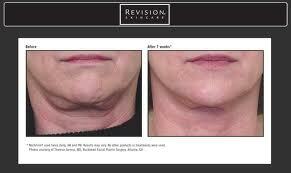 A youthful looking neck can make all of the difference for your overall appearance. The neck is remarkably susceptible to signs of aging because it is one of the most sun-exposed areas on your body and the skin is finer than facial skin. In addition, the skin does not have the same collagen content as your face. Nectifirm by Revision Skincare is a product formulated to help the skin appear more firm and lifted, reduce the appearance of rough, crepey skin and dramatically lessen the look of fine lines and wrinkles, all without having to go under the knife. It is the only product accessible that tackles all of the transformations that happen as the skin ages on your neck. Since the skin on your neck is different than on your face, the formula in Nectifirm contains powerful ingredients designed to specifically rejuvenate the neck as the skin continually ages. The product contains plant extracts, antioxidants and distinct biotechnical blends to produce a smoother, firmer, youthful looking neck. “I have been using Nectifirm for the past six months and I absolutely love it. I’ve always worn turtlenecks to cover up my crepey neck. Now that my neck is smooth, I’ve packed all my turtlenecks away,” said a patient. Schedule a consultation with the Shaw Center at (480)767-1900 in order to begin a Nectifirm regimen to achieve a tight, youthful neck!